Heat oven to 200C/180C fan/gas 6. Melt the butter in a pan or microwave. Very finely crush the biscuits together, stir with the butter, then press very firmly into the base of a 20cm round loosebottomed cake tin. Bake for 6 mins. Cool, then wipe around the inside of the tin with a little oil on kitchen paper. Soak the gelatine in water while you make the filling. Tip the chocolate into a bowl over a pan of simmering water, then add the milk. Gently heat until melted, then stir together. Squeeze the gelatine dry, add to the chocolate mixture and stir to dissolve. Beat the ricotta, cream, sugar and egg yolks together. In a separate bowl, whisk the egg whites. 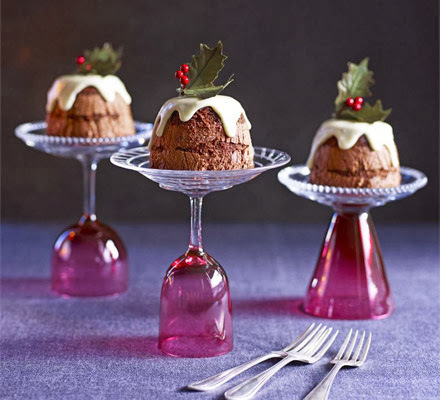 Stir the chocolate and ricotta mixtures together, then gently fold in the egg whites. Carefully pour onto the cooled biscuit base. Cover the tin with cling film, then chill until firm, preferably overnight. 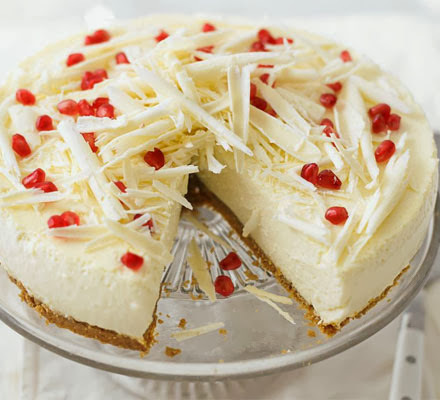 To decorate, very generously top the cheesecake with the white chocolate curls, then remove from the tin, scatter with the pomegranate seeds and dust all over with icing sugar, if you like.